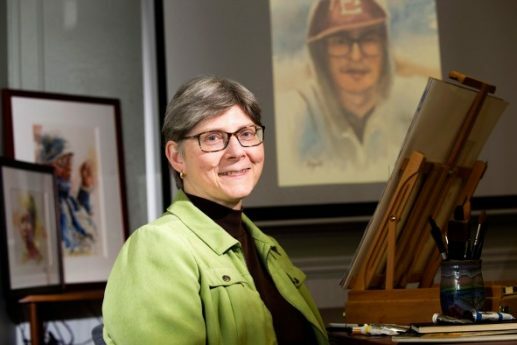 Rosemary Segreti, the interim registrar at the University of Georgia was recently profile regarding her painting as part of the 49 Portraits Project. … One of Segreti’s most recent paintings is part of the 49 Portraits Project, a national group of artists who are creating portraits of the 49 victims of the Pulse nightclub shooting in Orlando, Florida, in June. Begun by an Armstrong State University art instructor, the goal of the project is to hold an exhibit of the portraits and ultimately give them to the families of those who were killed. University of West Georgia Art Professor Erin Dixon and UWG alumna Justine Aldridge are two of 49 artists who were selected to participate in a project honoring the Orlando Pulse night club shooting victims who lost their lives on June 12. 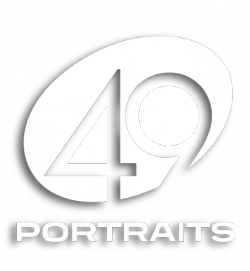 The project, dubbed 49 Portraits, was created by Mia Merlin, an art professor at Armstrong State University, who was inspired by a similar project that was done for the victims of the June 17, 2015 Charleston Emanuel AME Church shooting. LOUISA COUNTY, Va. (NEWSPLEX) — A local artist is one of dozens of artists across the country participating in a project to honor victims of the June shootings at the Pulse nightclub shootings in Orlando. 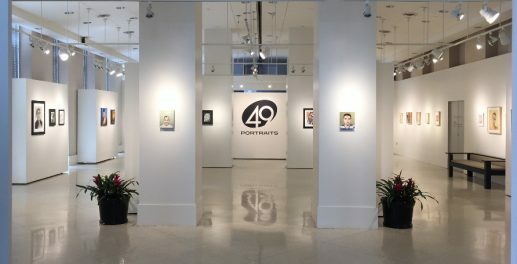 It’s called the 49 Portraits Project, and it was started by Georgia art professor Mia Merlin, who teaches at Armstrong State University in Savannah. Merlin says she was inspired by a similar portrait project following the June 2015 shootings at the Emanuel African Methodist Episcopal Church in Charleston. “I thought it was the perfect response,” said Merlin. When she reached out to fellow artists with the idea for the project to honor the Pulse victims, the response was overwhelming. Louisa County resident Sharon Shapiro was one of the artists who answered Merlin’s call. She says she wanted to do something to keep the victims’ memories alive. Shapiro painted a watercolor portrait of Martin Benitez Torres, a 33-year-old student who lived in Puerto Rico and who was visiting family in Orlando when he was shot and killed. She read online accounts and found a video he took of himself at a family member’s house just hours before he died. She says she was captivated by his smile, but painting a portrait of a young man whose life was cut short through violence was “emotionally difficult,” she said. “It just made me so sad, but it also made me glad that I could do something, some small something to cherish the life of this person and to commemorate him,” she said. All 49 portraits will be shown in Orlando in the spring, and then given to each victim’s family. Merlin says those families are just now discovering the project through the Facebook page, and Shapiro hopes Martin Torres’ family will find comfort from her painting. (September 8, 2016) – After the Pulse nightclub attack in Orlando that left 49 dead in June, Mia Merlin, a full-time lecturer of Art Appreciation and Foundations, felt helpless in the face of yet another national tragedy. Merlin was aware of a recent project at a Charleston, S.C., gallery, in which portraits of the victims of the 2015 Emanuel AME church shooting were rendered by nine artists who donated their time and talent. The pieces were presented to the victims’ families after an emotional unveiling and month-long exhibit. Unable to participate in that project, she wondered if she might be able to coordinate a similar memorial for the families of the Orlando victims. Merlin shared her impassioned vision for the “49 Portraits Project” in a Facebook prompt. The call was open to artistic styles and interpretations; her only request was that there would be an image likeness to the fallen individuals. Merlin asked her friends, family and colleagues, largely based in her hometown of Atlanta, to share the post widely. The response was overwhelming. From notable master pastelists to tattooists from across the country, celebrated artists responded in droves, all but begging to be a part of the project. Currently, there is a waiting list. Nearly all of the portraits are completed with the remaining few to come soon. Merlin herself contributed a canvas of 30-year-old U.S. Army Capt. Antonio Devan Brown, “a gentle soul,” depicted in soft oil brush strokes. The portrait hangs in Armstrong’s Fine Art Gallery through mid-September, and she hopes it will soon relocate to Orlando. Merlin is in talks with Orlando’s mayor to organize an exhibit in City Hall, followed by a gifting ceremony for the victims’ families.